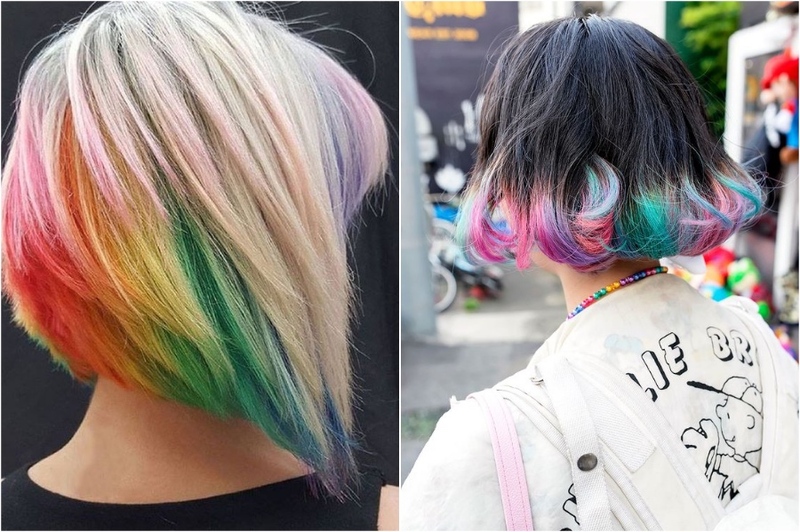 Rainbow hair has basically become mainstream in the past decade. It started as something only alternative kids would be brave enough to do and these days you can no longer shock people with colorful hair. I think it’s for the best. You no longer need a real reason to go crazy with your hair colors and it’s also nice being able to have colorful hair without it being a huge statement or a way to rebel against anything. Having said that, rainbow hair has transcended its name. We no longer mean actual rainbow colors when we talk about rainbow hair. It’s come to mean a combination of various bright or even pastel colors combined in one hairstyle. 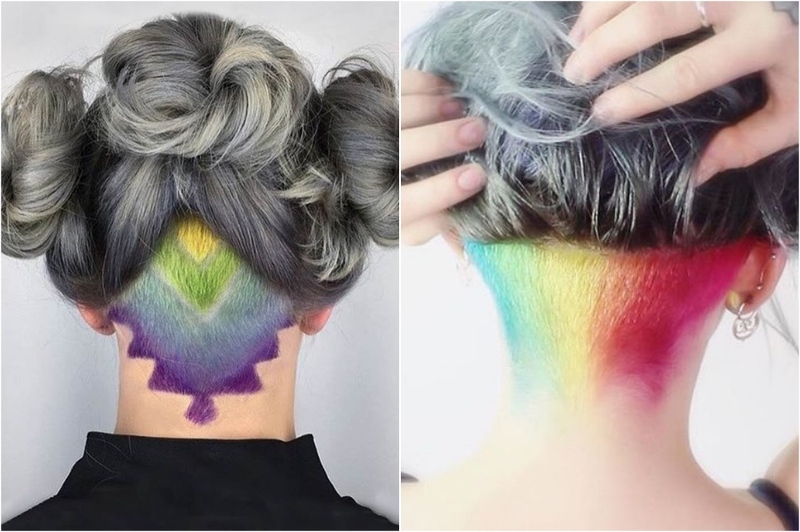 There’s also so many ways to do rainbow hair now that you can definitely find one that works for you. 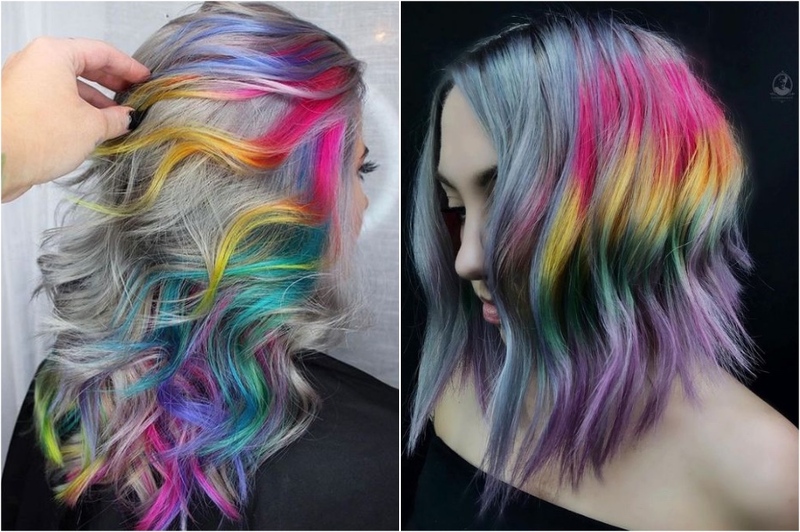 The beauty of rainbow hair is that you can pick the colors that work best with your skin tone and it looks equally awesome on hair of all lengths and textures. 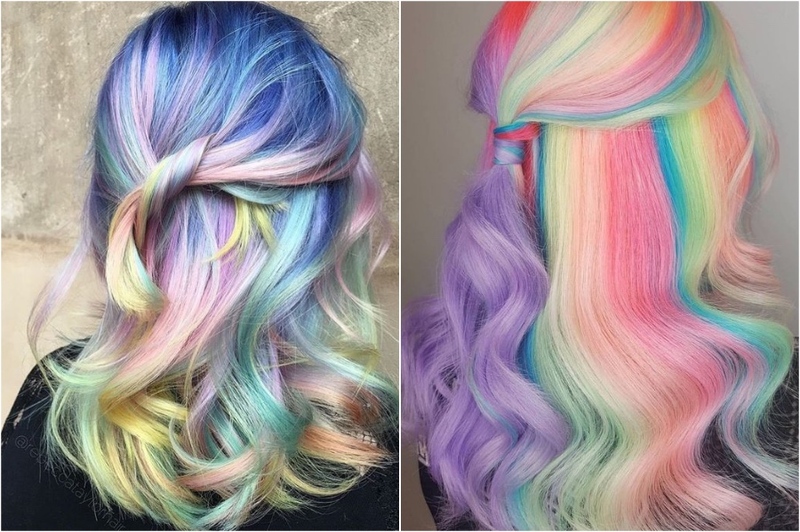 Let’s take a look at 12 rainbow hair color ideas to rock this spring. 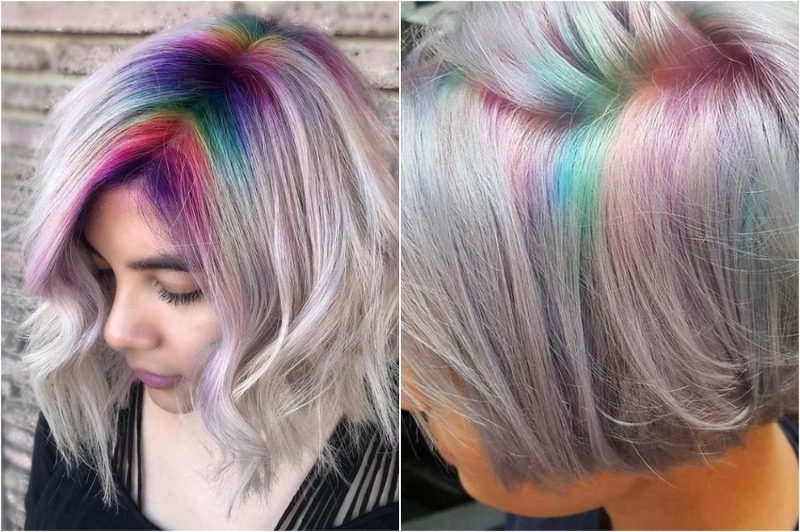 Going full-blown rainbow might seem a bit harsh if you’ve never tried it before but I think everyone will agree that this pastel variation of rainbow hair is just chill enough for first timers. It’s cute and playful without being too much in your face. Oil slick is a variation of rainbow hair that works perfectly for those who prefer blue and purple tones and as a bonus it works on dark hair, so you don’t have to go blond in the first place. It’s also a great choice for those who are rocking silver hair at the moment but want to add some color. This is a perfect rainbow hair idea if you don’t want to be the center of attention at all times. This hidden rainbow allows you to make a statement when you do a ponytail or a half updo, but you can remain a normy on the days you wear your hair down. 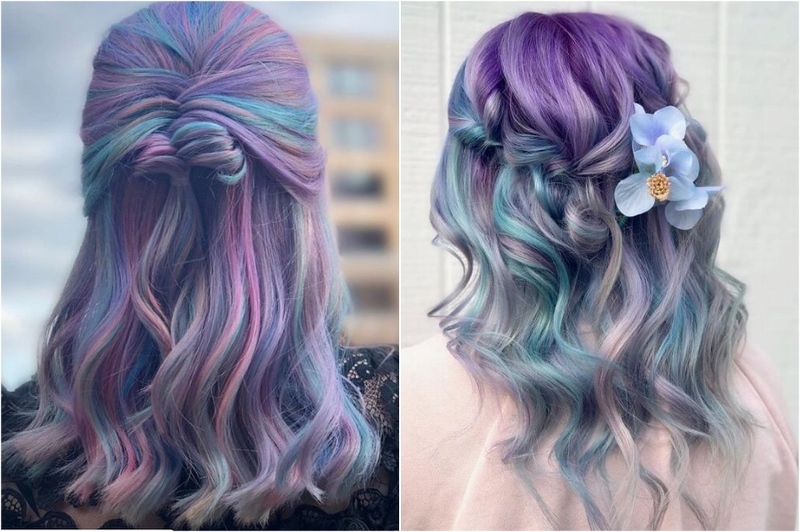 Possibly my favorite variation of rainbow hair is cold toned pastels. Blues and purples just look so magical and I think this is the best kind of hair for spring. Ok, you can add a touch of pink to this too. Don’t you think this hair will compliment every single spring dress you have? A clever new idea for rainbow hair is rainbow roots. This way you only bleach and color the roots of your hair, making it look like your natural root is growing out in rainbow colors. It’s also a cool way to spice things up for those of you who are naturally blonde but you tend to go for dark colors. This would be the funniest way to hide your roots. 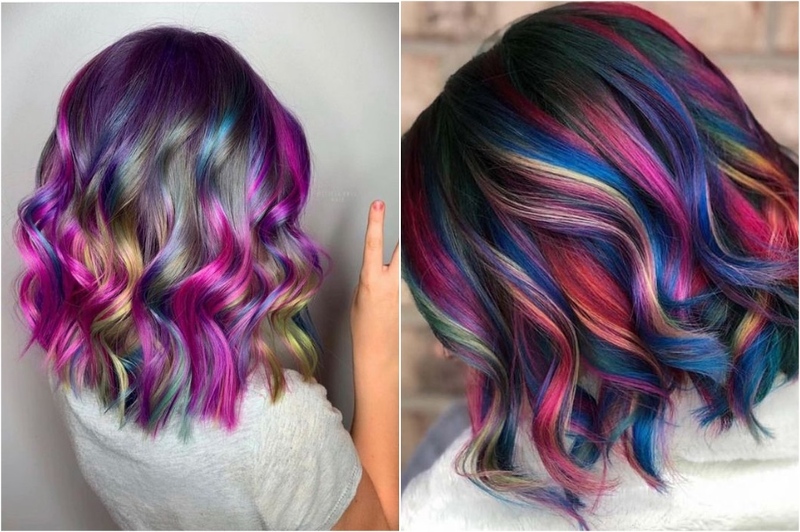 By only choosing to do the top layers of your hair in rainbow colors you allow for much more creativity with the rest of your hair. This type of rainbow hair would look good with dark and light colored hair, and of course silver will look smashing as a background color as well. Rainbow dip dyed ends are the safest bet out there. You get to enjoy the crazy colors and play around with various shades, and you don’t even have to compromise all of your hair. It will most likely wash out and fade into barely visible pastels, but even if it doesn’t and you change your mind you can always cut off the ends. If you have a bag (or as the brits like to call it – a fringe) you might be a bit sick of having to style it the same way every day. Why not give it a colorful upgrade? 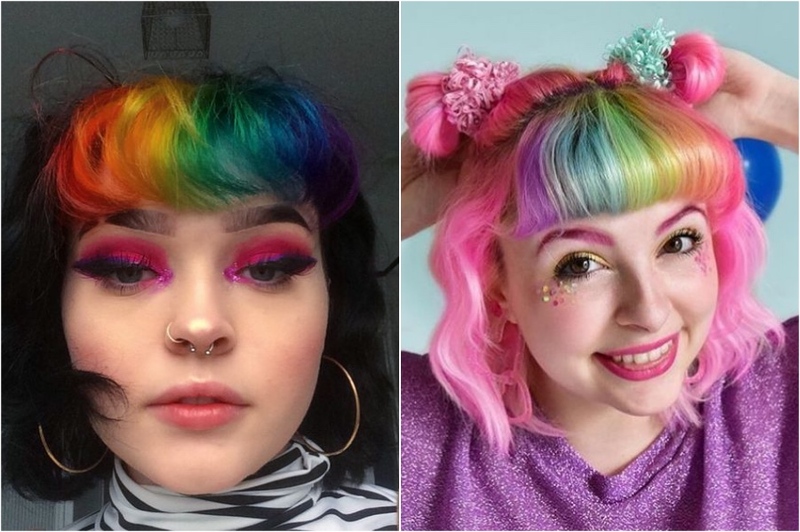 Rainbow bangs look equally amazing with pastel and natural hair, so you really have no reasons to chicken out. It’s just your bangs you can color them back any time. 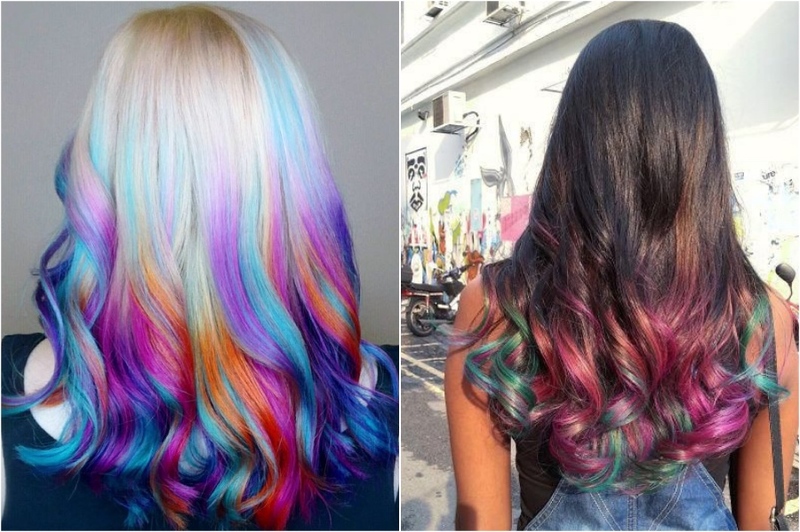 This is what I was talking about when I said rainbow hair looks good on any hair length and texture. 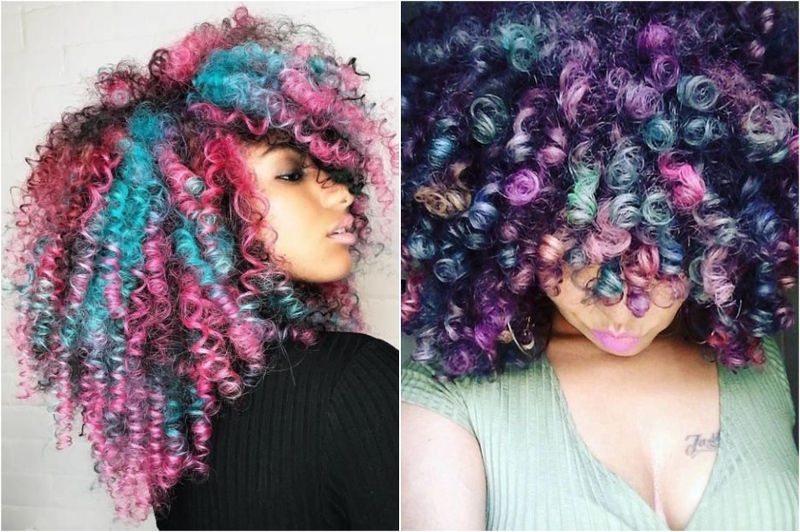 In my humble opinion rainbow hair looks even better on curls. It’s just way more fun and playful no matter how tight or big your curls are. An undercut on its own isn’t that exciting anymore. But make it rainbow and suddenly it’s like a breath of fresh air. I think it looks especially nice when you integrate various geometric shapes into it. Rainbow hair also looks great on lobs and bobs. 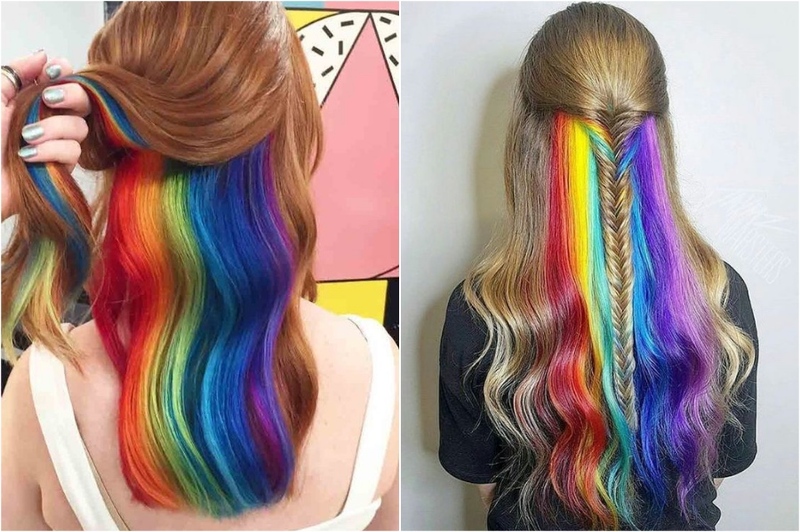 You can do just the underside of your hair or just the ends if you don’t want to go rainbow all the way. Either way the result will be absolutely stunning and a head turner for sure. 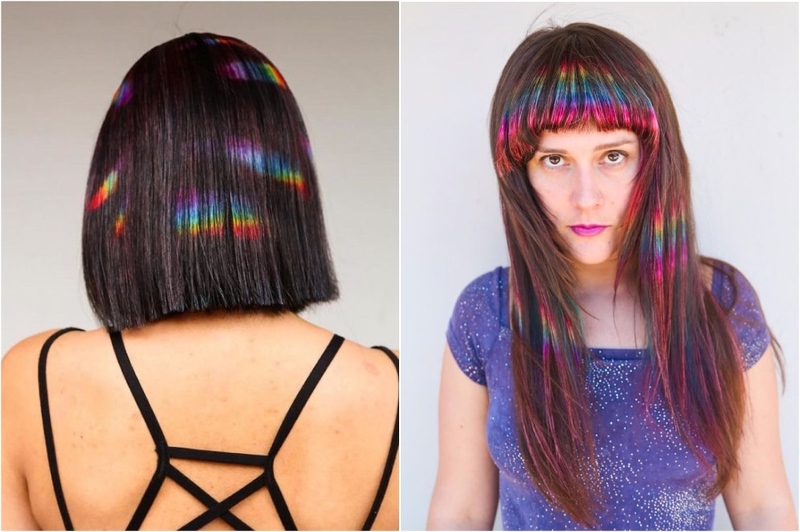 One of the newest trends in rainbow hair is prism hair. The idea is to color only small sections of your hair to make it look like your hair is catching the light through a prism. Who needs Instagram or Snapchat filters when you can permanently get this effect with just hair dye.